At Nexus Psychology, we offer quality affordable counselling sessions with highly recommended psychologists. Our Psychologists aim to provide cost-effective therapy to clients understanding that engagement with therapy requires an extended personal and financial investment. Understanding the rates for counselling and therapy sessions, how payment works, and what your funding options are can often seem quite overwhelming. In some instances counselling fees may be subsidised by Medicare rebates, private health insurance, or other funding sources. To shed light on how fees work, we outline here, as simply as possible, the numerous ways in which counselling can be paid for and what the cost incurred is. However, we appreciate that every situation is unique, raising unique questions that can sometimes only be solved in a conversation. So, our friendly and knowledgeable reception team are on-hand between 8.30am and 8pm to answer any queries you may have, via telephone call or email. To be able to claim a Medicare rebate, you would first need to contact your GP to discuss with them why you would like to come for counselling. Your GP will then run through a list of questions with you to determine if you are eligible a Mental Healthcare Plan. If your GP decides that you are eligible for the plan, they can then refer you to us enabling you to claim the Medicare rebate, which as outlined in the grid above will reduce your out of pocket cost to between $85 and $105 per session, for up to 10 sessions. Medicare rebates can now be processed online OR using a phone app. Check this 1 minute video for information on how this works. Many private health funds cover a portion of the cost of psychology sessions. Typically, the rebate is approximately $40 per session for up to $400 per year. Please do check with your provider about the details of your cover. You cannot claim a private health insurance rebate together with a medicare rebate. 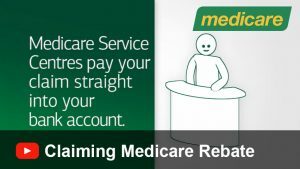 If you are not eligible to claim the medicare rebate (eg, 10 sessions are complete) then you may be able to (depending on your cover) claim a rebate via your private health insurance. There are no advance payments necessary for your sessions. Instead, we ask that payment for each session is made on the same day that you attend. After your session, your psychologist and the reception team at the location will be able help to process this payment, which can be made via credit card, cash, or cheque. Once you have booked an appointment with us, should you need to cancel or rearrange we ask that you call our reception to inform them, giving more that 24 hours notice. However, for clients calling to cancel or rearrange an appoint on the same day (within 24 hours) please be aware that a cancellation fee will be incurred, and that Medicare rebates cannot be claimed on this cancellation fee. The TAC, Transport Accident Commission, is a Government-owned organisation, that funds treatment and support services for those who have been involved in, or affected by transport accidents. We understand that the physical and emotional trauma that transport accidents can inflict, often cause long-term difficulties for those involved and can change our lives in ways which are extremely difficult to cope with. At Nexus, we can provide TAC registered psychologists, with expertise in trauma, pain and health issues, and our admin team are able to process payments funded by the organisation. WorkCover (also known as WorkSafe), can provide funding for counselling for individuals who have either been injured at work, or for those who need support due to stress in the workplace. Within the Nexus team, we have several WorkCover registered psychologists who are able to offer expertise and a wealth of experience in these areas, in addition to guidance for legal matters in the workplace. The Nexus Psychology team is diverse and dynamic, specialising in a broad range of emotional issues, and catering to people of all ages. We specialise in a wide range of emotional issues, such as Anxiety, Depression, Anger, Phobias, Self-Esteem, and more. Schedule a call with us to learn more. Want to know more about our intake process, and what to expect from counselling? Speak to our friendly reception team on 9500 0751 Mondays to Thursdays between 9am and 7:30pm and on Fridays between 9am and 6pm.